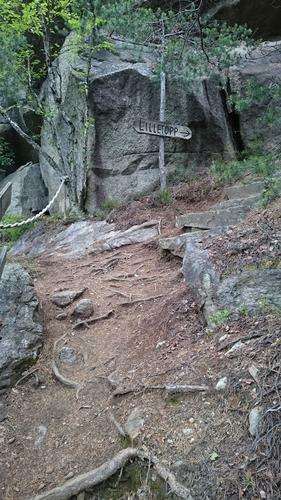 Hike Lilletopp - worth a visit! 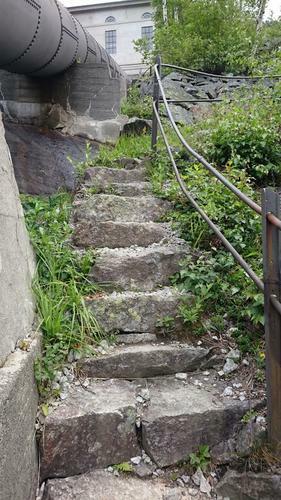 The hike to Lilletopp is a perfect warm-up for the major hike to Trolltunga! 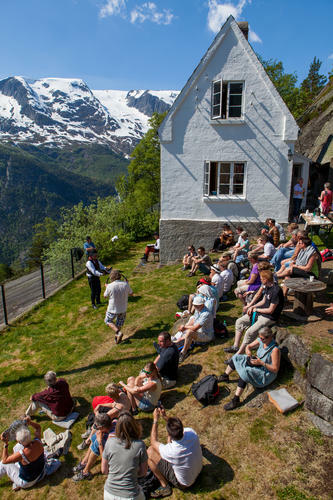 Or a perfect recreation hike the second day of your stay in Odda. This hike is suitable for all ages. 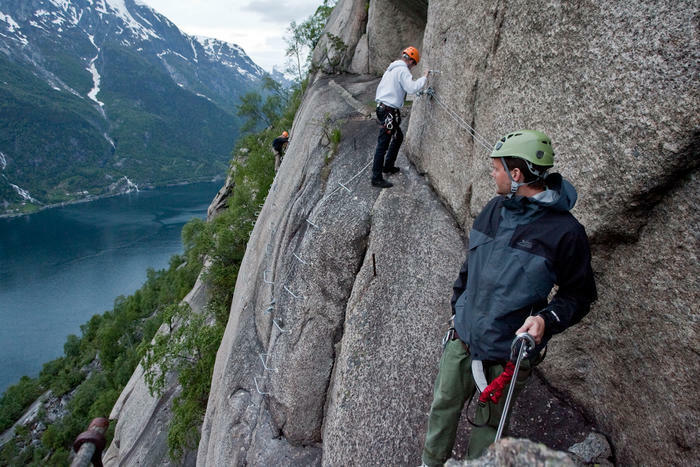 It takes 20-30 minutes to reach the top, where you will be rewarded with a stunning view over fjord, mountain and glacier. 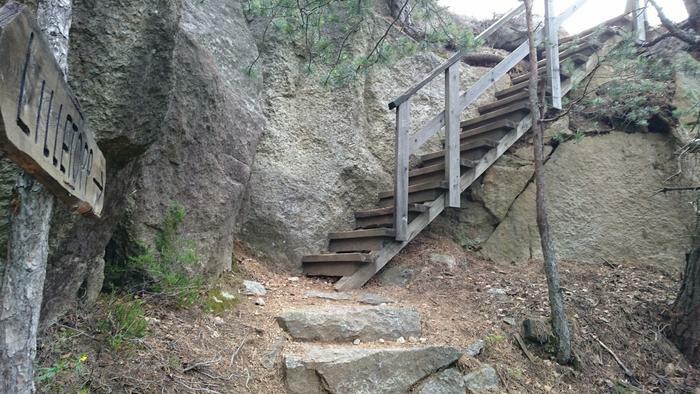 The trail is heavy, but easy to manage, at some places with wooden or rocky stairs. The hike itself can be done without a guide. 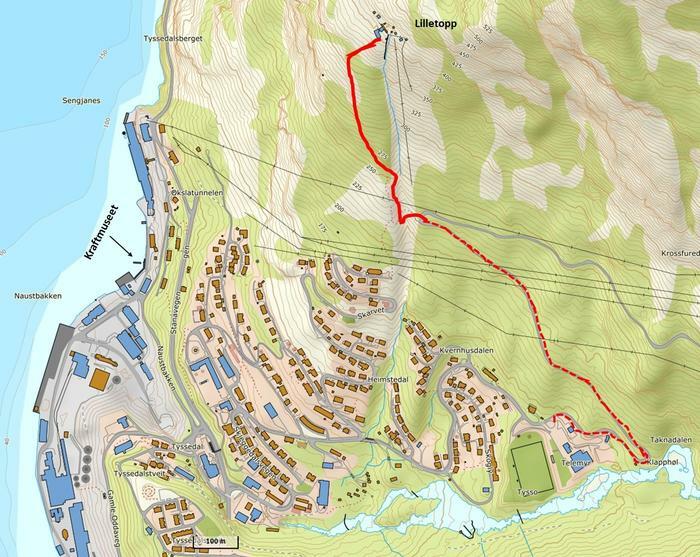 You will have to park your car at the car park by the sports arena in Tyssedal, then walk approx. 1 km before you reach the curve where the trail starts. 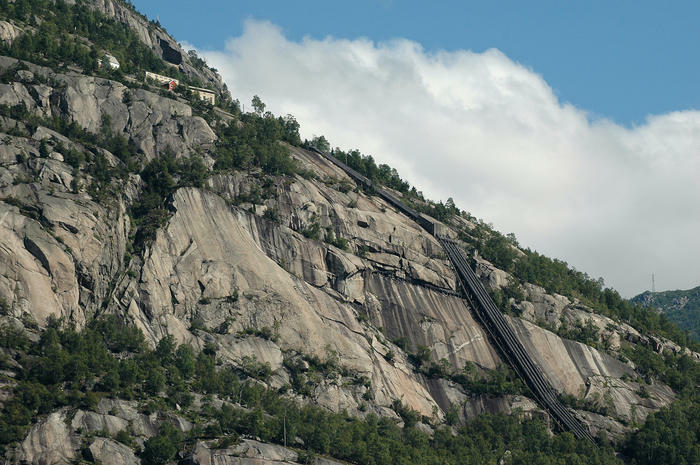 The red line showing the way from the car park in Tyssedal. To avoid parking fees, contact the museum reception in Tyssedal (Naustbakken 3, 5770 Tyssedal) to get your free short time parking ticket! Only during opening hours. 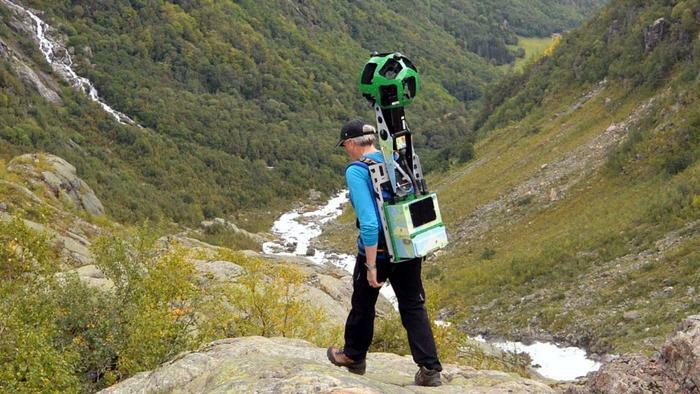 You can also "do" the hike on google street view - just click the photo: Google street view on tour. 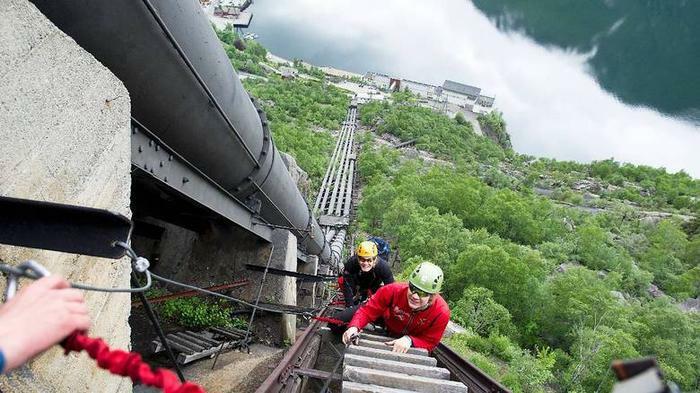 Once you have reached the top, you can join us in the footsteps of the navvy on a guided tour through tunnels and caves in the hydropower facilities inside the mountain. Hear the stories about the hard working navvies building the caves and the tunnel under harsh conditions during the years 1906 to 1915. 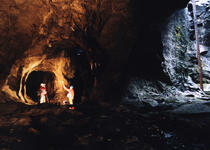 Guided tours twice a day all days during the summer season. 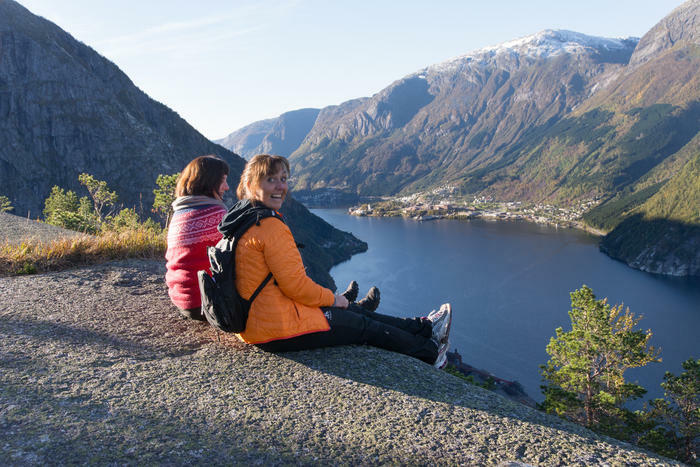 Some five minutes hike further up the mountain you can enjoy the magnificent view over the Hardangerfjord and the Folgefonn glacier from the cliffs of mount Oksla. 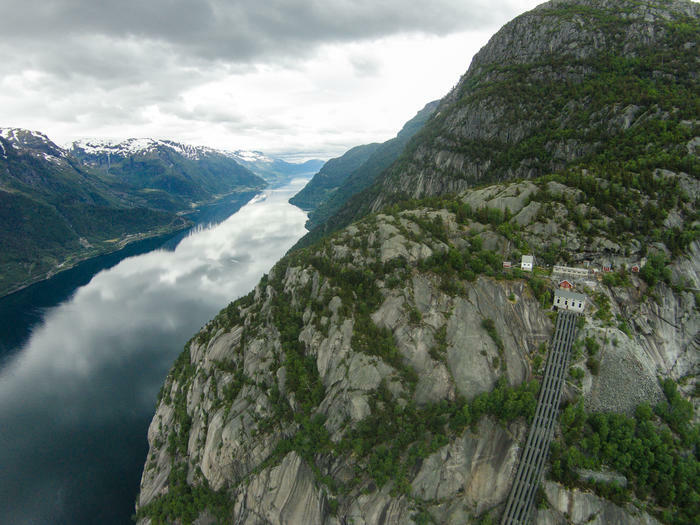 Overlooking Odda and the fjord while dangling your feet over the edge. 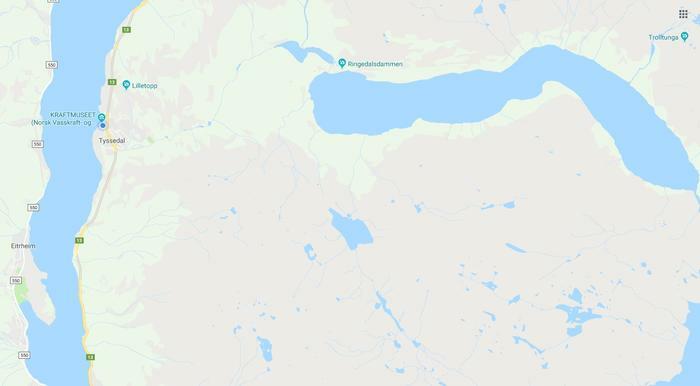 From 1915-1923 the damm guard lived in Lilletopp with his family.The children went to school in Tyssedal every day - without skipping it once. 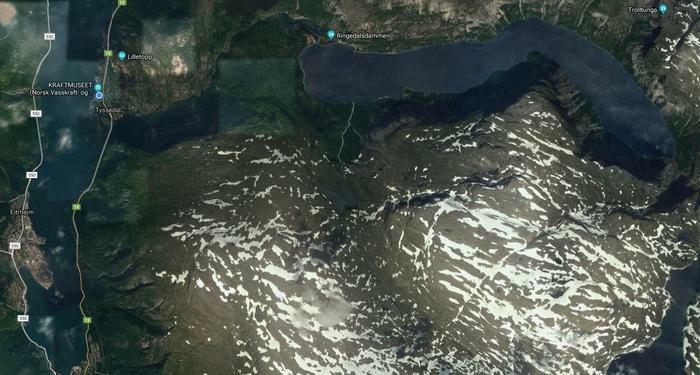 During the second world war both norwegian and german guards and soldiers were stationed here. 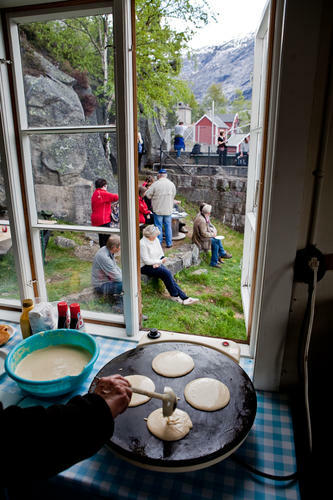 The house is now used by the museum - during the summer season you will find a small café here. 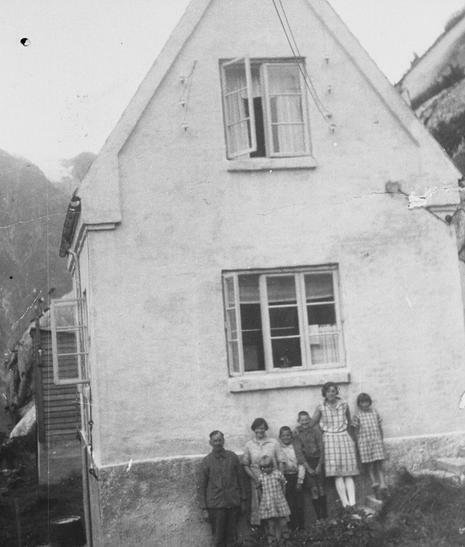 The damm guard Jondahl with family in front of the house. Photo: Kraftmuseet archives. During the summer season the facilities in Lilletopp will be open all days from 11am to 4pm. 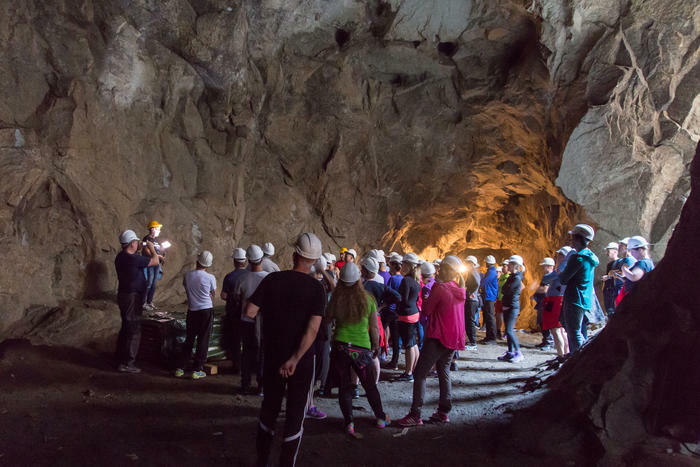 We offer guided tours through the tunnels and caves, showing film and giving you the opportunity to try the tools of the navvy. The guided tour and film will take about one hour. There will be an open café during the summer season. Click the map/foto and find more information at Google maps. 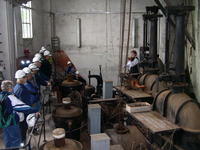 Off-season we offer guided tours for groups booked in advance. Contact the museum for further information. Watch the following film footage to get an impression of the site and hear a piece from one of the concerts that have taken place there. 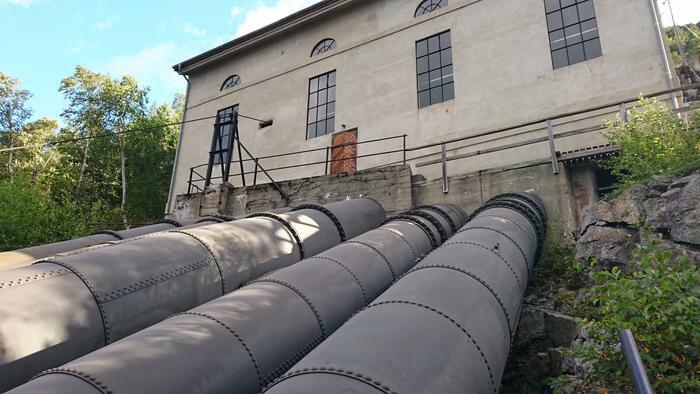 Another, and more exciting alternative to the hike, is the climb alongside the penstock together with scilled climbers. Suitable for all ages from 15 to 70! Times have changed from when the navvies put their lives at risk at the beginning of the 20th century. 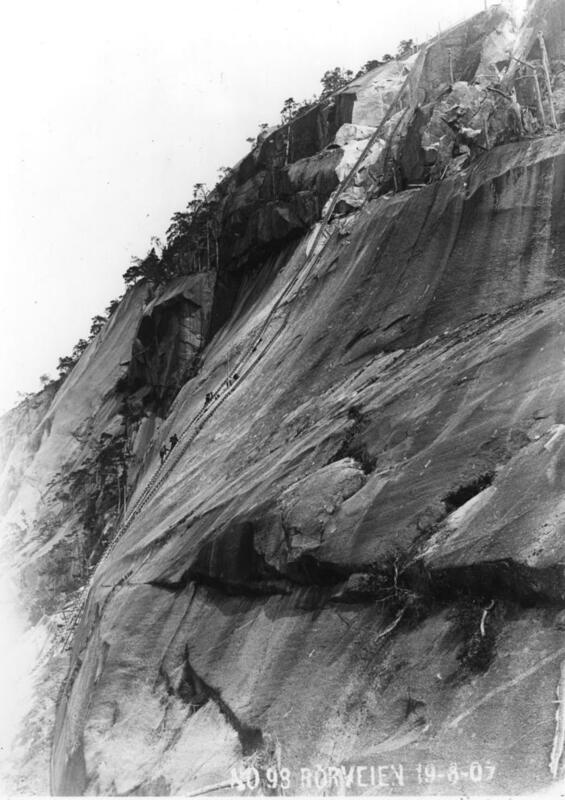 Today climbing gear is mandatory and safety absolutely put first! On a guided tour through the caves and former distribution pool that used to be filled with water. Your friend has been mailed an recommendation about this article.